Stir together chili powder, paprika, garlic powder, red pepper flakes and cumin in small bowl. Preheat oven to 350 degrees F. Sprinkle chili mixture evenly on both sides of each pork chop, rubbing mixture into pork. Heat 1 tablespoon oil in cast iron or oven-safe skillet over medium-high heat. Place pork chops in hot oil to brown, turning once after 3 to 5 minutes. Add remaining tablespoon of oil if needed. Remove skillet from burner and place skillet in preheated oven. 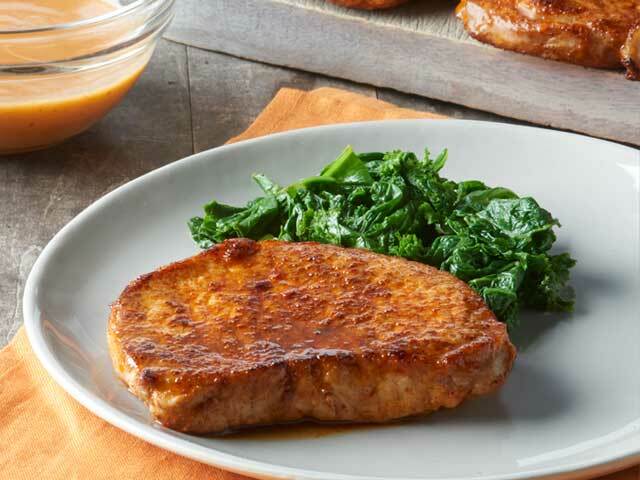 Bake pork chops 15 to 20 minutes. Remove chops to serving platter. Let stand 3 to 5 minutes before slicing. Serve with grits, simmered greens or fried corn.